Constructed by Hensel Phelps Construction Co. 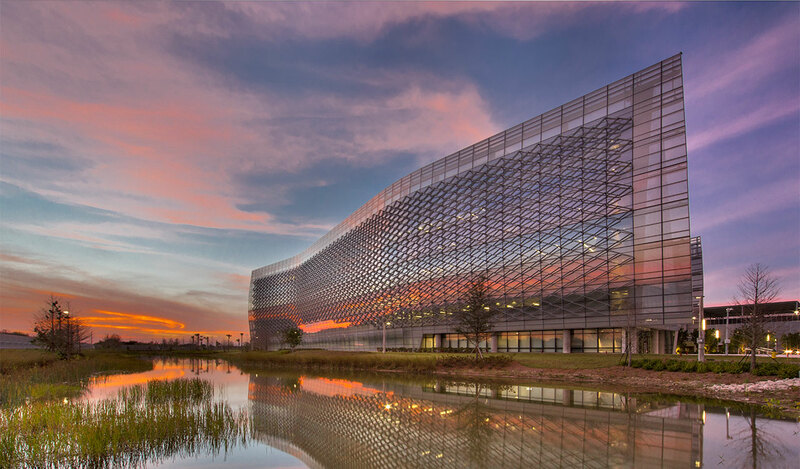 Designed to be the FBI’s Miami Regional Headquarters, this project in Miramar, Florida is actually two buildings, each 6 and 7 stories respectively, connected by a link. 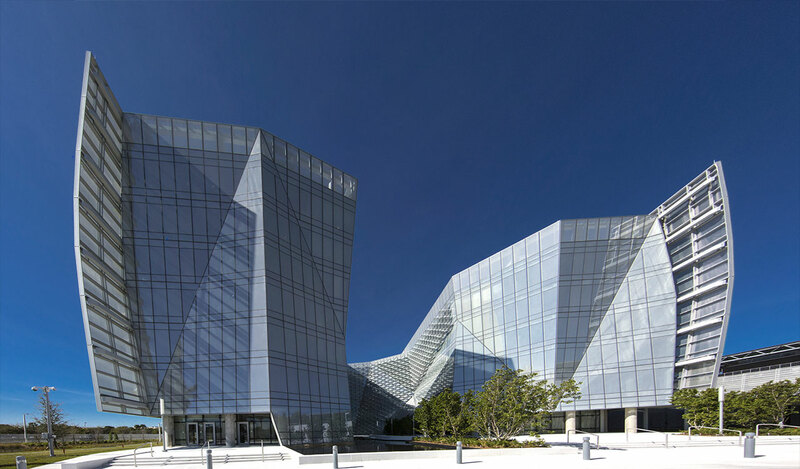 With a construction budget of $159 million, this GSA venture stretches the limits of traditional construction, with an undulating façade that curves and folds in two directions with a high performance curtainwall system wrapping around a non-orthogonal structural grid. 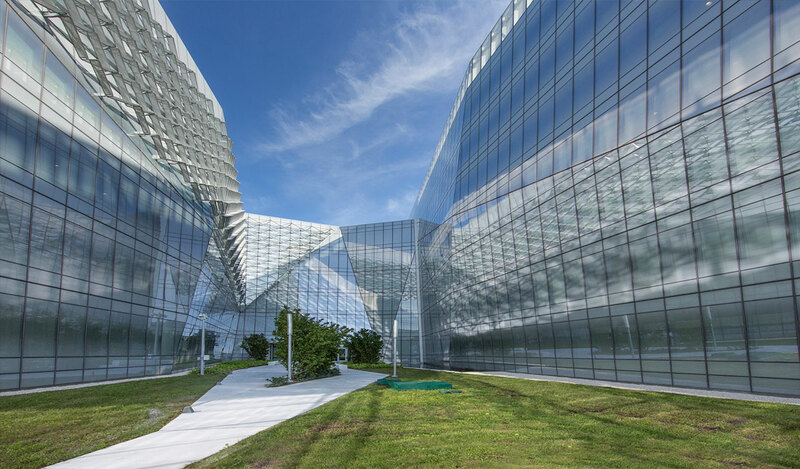 A key aspect of the design was a striking but complex sunshade system, comprised of bent, diagonal ribbons of perforated aluminum. 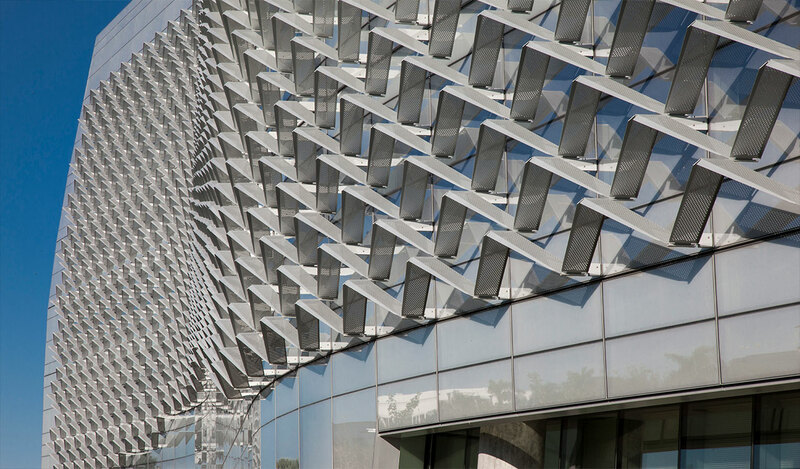 The exterior perforated sunscreens present most predominantly on the South Facades but also appear on the East and West Facades of the link between the two buildings. 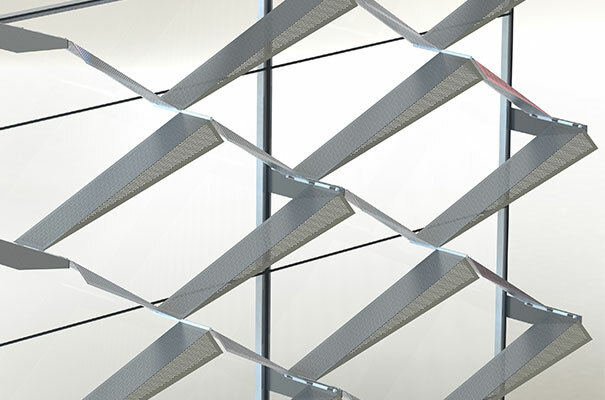 Used primarily to lessen the use of artificial light in the building by reflecting natural light onto the interior ceilings, the perforated sunshade system had to conform to the changing radii of the convex and concave curtainwall contour. The system also had to meet some of the most stringent building codes in the U.S. in accommodating 140 mph (225 km/h) hurricane force winds. This Federal Building was also required to satisfy the guidelines established by President Obama in a 2009 Executive Order that all federal buildings achieve zero net energy use by 2030. 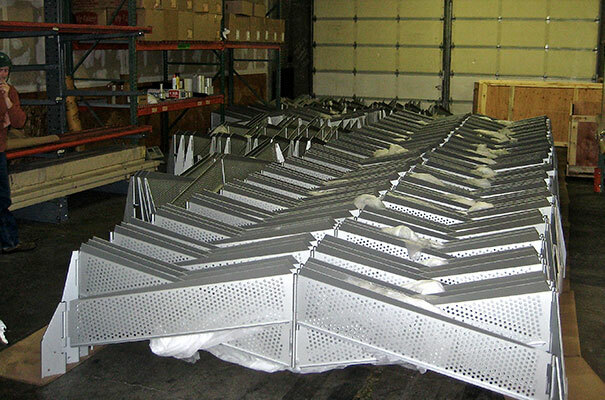 Shade system concept development, preliminary engineering, mockups and production. 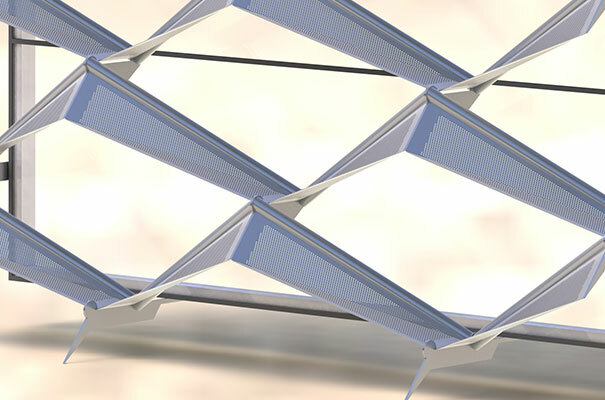 Competitive bid proposals had been requested by the Federal Government and ELEMENT responded to the challenge presented by the geometry with an innovative flexible, folding shade array concept. 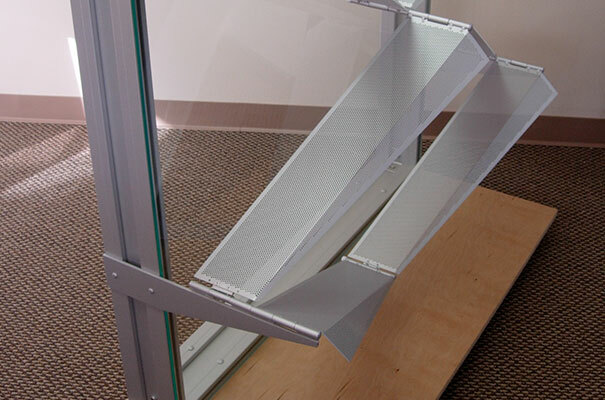 Utilizing standard break-formed shapes with hinged connections that collapsed to a fraction of the final size for shipping, the shade system was unitized into collapsible modules that expanded accordion-style to full panel size, for installation on site. Naturally since the exterior perforated shade system in its installed form contained a large volume of empty space, conventional methods of construction would have added significant costs in freight and handling. 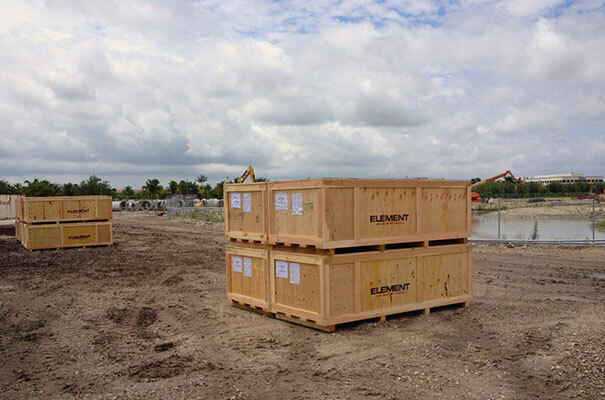 ELEMENT’s innovative solution saved both freight and shipping costs, and minimized storage space on site. 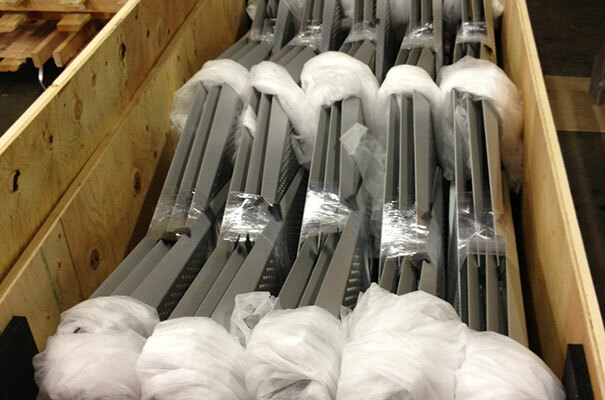 The fact that entire shade arrays were stored in crates also minimized the likelihood of damage by keeping the shade system protected until the time of installation. To demonstrate the viability of its concept, ELEMENT built a quarter scale mockup for presentation to the G.S.A. and Design team, during the competitive bid process. 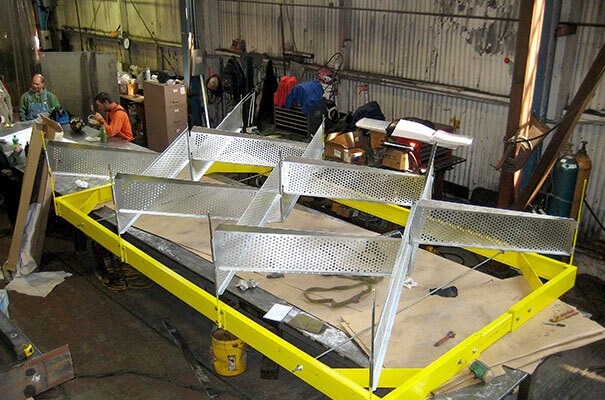 ELEMENT’s mockup offered the only viable solution to the sunshade design that addressed the aesthetic and structural requirements while keeping cost to a minimum. 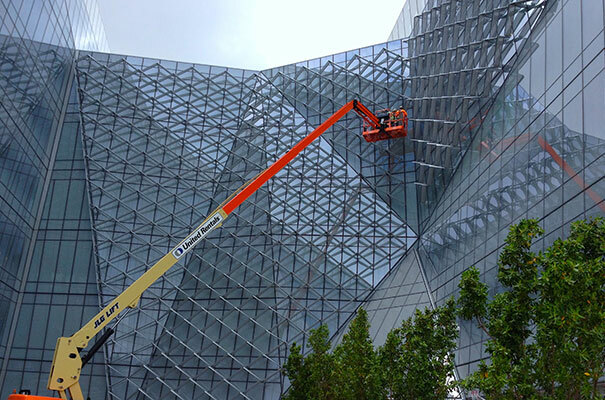 Our design provided significant labor savings by eliminating over 43,000 field fasteners and allowing the shade arrays to be quickly attached immediately prior to installation of the unitized curtainwall panels. 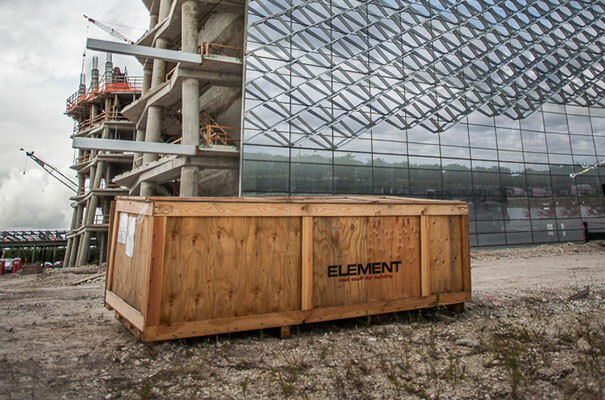 ELEMENT provided over 10,000 shade components many of which were location specific to accommodate the curves, folds and plane breaks in the building. 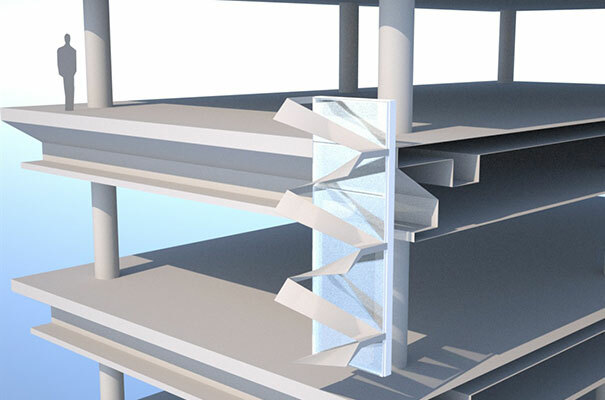 The link between the two buildings presented another set of design challenges since there were multiple plane breaks in the curtainwall surface; every shade blade and assembly was individually modeled and fabricated to accommodate the design intent.